Cap Ferrat is one of the three major capes of the French Riviera and in my opinion probably the most beautiful. Like a long arm jutting into the Mediterranean, it separates the bay of Villefranche and that of Beaulieu, about half way between Nice and Monaco. It is also one of the most expensive parts of the coastline in terms of real estate, dotted with the exclusive and secluded Belle Epoque style villas of the rich and famous who first discovered the Riviera in the 19th century and found that the climate and scenery were so amazing that they decided to stay. 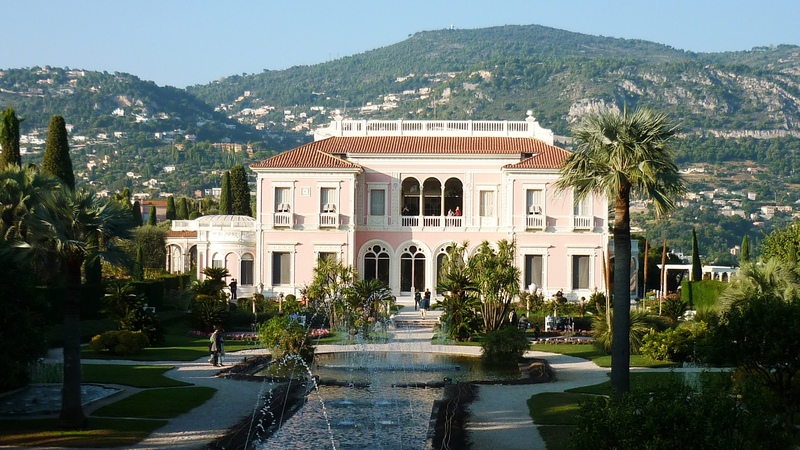 One of the most prominent of these villas and the only one open to the public is the Villa Ephrussi de Rothschild, built by Beatrice Ephrussi de Rothschild, a very wealthy French socialite, between 1905 and 1912. 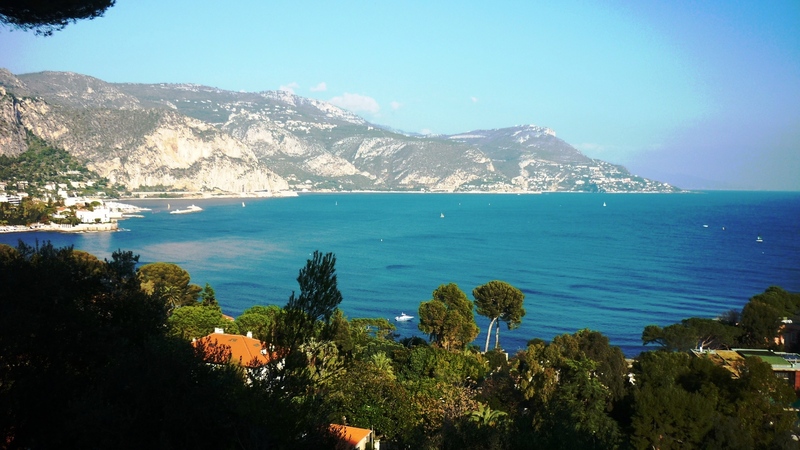 She was lucky enough to be able to pick one of the best sites on the Cape, at the top of a narrow isthmus dominating the sea that provides stunning views both east towards Beaulieu and Italy and west towards the deep waters of the Bay of Villefranche and its ancient harbour. Upon her death in 1934, she donated the property to the Institut de France, who have maintained it to this day. In 22 years living here, I’d never visited the Villa Rothschild apart from a classical music concert once in the grounds during the 2003 summer heat wave: so when some friends called me on a beautiful November’s afternoon, I figured that now would be the perfect opportunity to discover something new… Incidentally, that’s one of the great things about living in such a beautiful area, there is always something new to explore, see and do. So here’s some feedbacl about my visit. 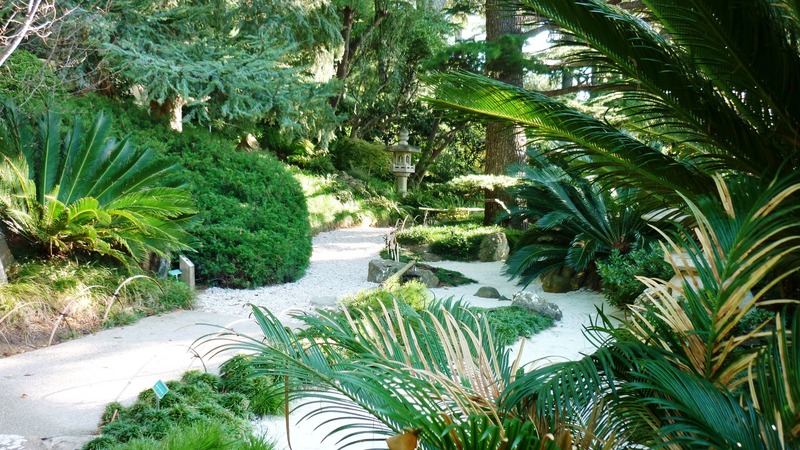 First there is a very well-signposted tour around the 9 beautiful themed gardens that dominate the property: Japanese, Florentine, Provencal, Spanish, exotic (so plenty of cacti like in the Exotic Garden of Monaco), French, a rose garden and a rock garden. Mrs Rothschild commissioned some of the best landscape artists of the time to design the different areas, no mean feat given the steep, rocky terrain and the windswept nature of the location. However the result is a real success, with each garden making the most of the stunning natural environment and having its own specific charm, bringing the visitor into a special sensory world. The highlight is at the end of the walking tour and the downhill approach towards the pink villa through the monumental French gardens, full of classical statues, a great place to take picture postcard photos. Every twenty minutes, the famous “musical fountains” move into action with some Mozart – I’m not a great fan of this kind of thing but I have to admit that the effect was rather nice. Mrs Rothschild’s favourite colour was obviously pink as the whole villa is flamingo-coloured… The interior is surprisingly tastefully decorated (I was expecting decadent tackiness but was rather pleasantly surprised) and was obviously very luxurious at the time, complete with budgerigars which are all that are left of the menagerie of exotic animals that she had brought along to keep her company. Touring round the various reception and private rooms gives an interesting insight about how the well-off lived during the Belle Epoque. 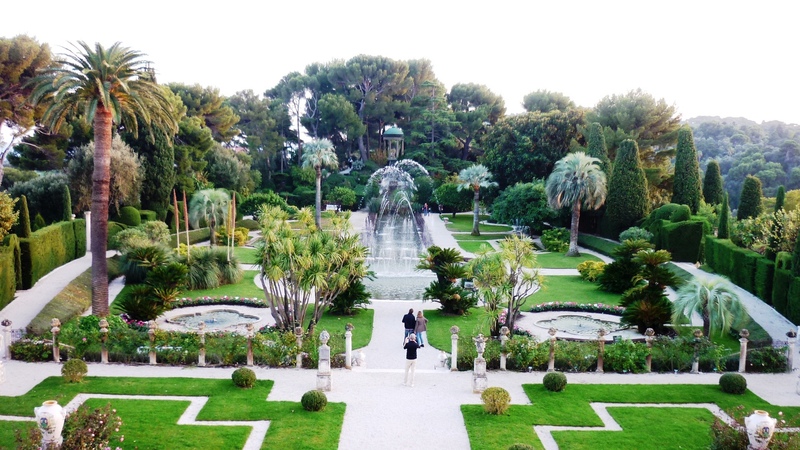 Make sure you go upstairs and enjoy the stunning views from the balcony overlooking the French gardens, with the best viewpoints over the “musical fountains” – there is also a rather interesting film about the history of the villa. Vantage point on the balcony of the villa overlooking the gardens: you feel like nobility just by sitting there! 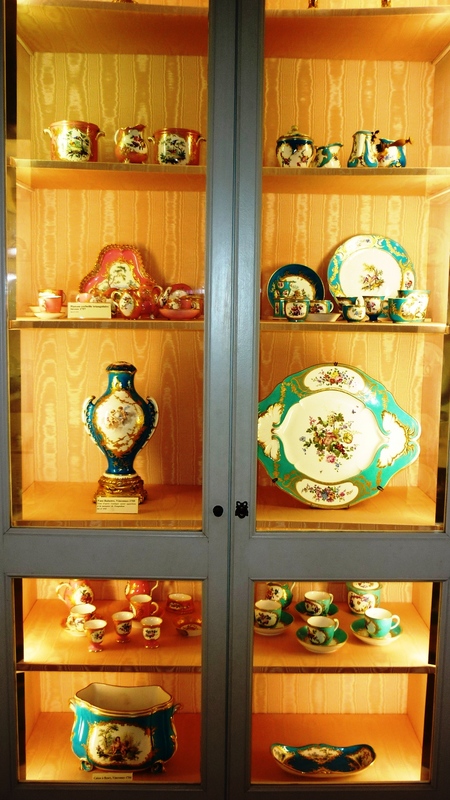 For those who enjoy the doll house atmosphere, her porcelain collections are also exhibited, with some rather questionable colours which presumably were considered trendy at the time. 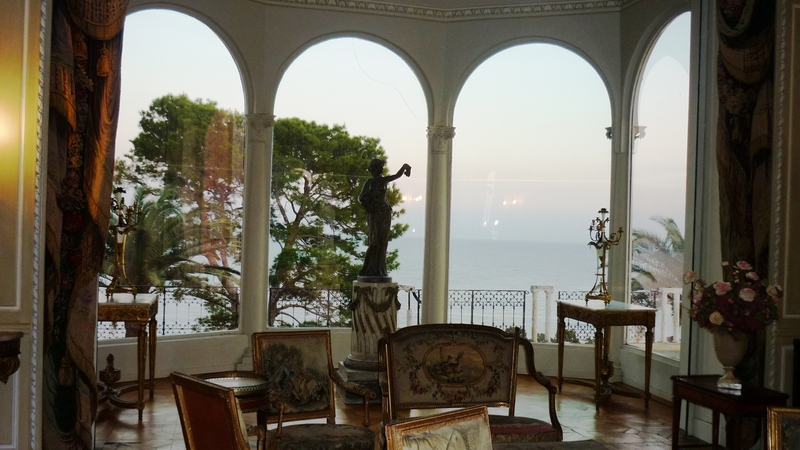 So all in all, it was a very interesting afternoon out and the Villa Rothschild is definitely worth visiting if you have a bit of time to spare in Cap Ferrat. If you fancy making a day out of it, I would suggest combining with a visit to the Greek Villa Kerylos a short walk down the coast in Beaulieu and a nice walk to enjoy the stunning natural views along the Cape for those with more energy. 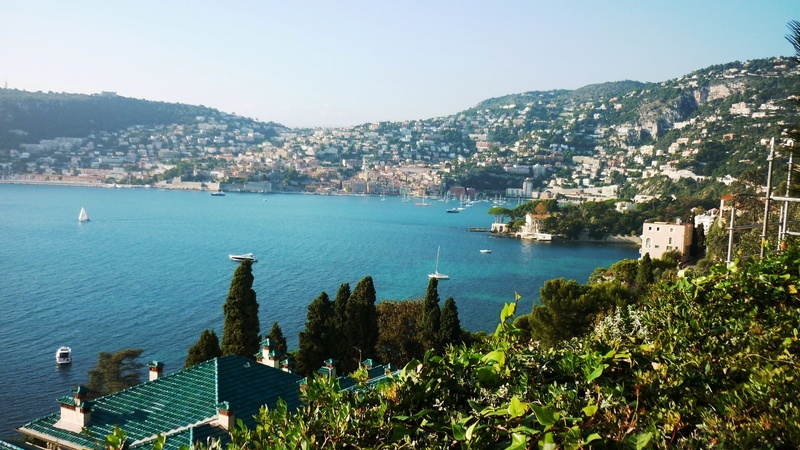 – By train: get off at Beaulieu sur Mer station and follow the coast along the foot of Cap Ferrat and then the signposts up some steps to the villa. It’s about 30 minutes’ walk but worth it as the views across the Baie des Fourmis in Beaulieu are stunning, with some beautiful cliffs plunging straight into the sea. – By bus: from Nice, take line no. 81 (timetables here) from the centre and get off at the “Office du Tourisme” stop when you arrive in Cap Ferrat, the Villa is about 5 minutes’ walk away. From Monaco, take line no. 100 (timetables here) and get off at Pont St Jean, then walk about 20 minutes in the direction of the tourist office and then to the Villa (the walk is rather boring and there is plenty of traffic on the main road so not particularly recommended). A rather steep 12 € but at the end of the day, the experience is diversified and interesting enough to be worth it. The price includes access to the gardens, to the inside of the villa (including an audio guide) and all the exhibits. For those interested in visiting the Greek Villa Kerylos in Beaulieu, combined tickets are available. For full information on the Villa, here is the official website. And finally, for those wishing to learn more about the Ephrussi family and gain some background information about the Villa, I was recommended to read The Hare with Amber Eyes, by Edmund De Waal. This entry was posted in The coastline east of Nice and tagged Azur, Côte d'Azur, Cote, french, french riviera, french riviera blog, frenchriviera, frenchrivierablog, holiday, kevin hin, leisure, mountains, riviera, seaside, travel, vacation. Bookmark the permalink. Browsing through your blog. Good articles and love the pics. We have found this blog so helpful for our holiday in April to Nice. Thanks. Thanks Margaret, glad to have helped, I’ll post more articles in the coming weeks. I hope that you enjoy your holiday on the Riviera next month! Hi, yes, bus no. 81 between central Nice and the port of St Jean Cap Ferrat runs between the two: from the Villa Kerylos in Beaulieu, take the “Kerylos” stop nearby and just get off three stops away at “La Rade”: the Rothschild Villa is just 3 minutes walk away from there off the main road (it’s pretty well signposted). Full timetables on this link (only in French unfortunately): http://www.lignesdazur.com/ftp/lignes_FR/ligne%2081%20%28au%2024%2010%2011%29.pdf . But if you can do the walk, it’s very scenic (passing in front of David Niven’s villa) and takes 20 – 30 minutes at a leisurely pace. In that case, I’d advise to start at the Rothschild Villa and then head to Villa Kerylos as it’s downhill and then straight along the picturesque coastal path. Friom Beaulieu, you can just take a train anywhere along the coastline. How much would a cab be from Monaco? The most beautiful and tastefully done home I’ve ever seen. I will visit again.